Mathematics is the language of science. It is an essential part of work in the natural sciences, engineering, economics, and other areas. In many civilizations, mathematics has been since ancient times a crucial element in intellectual development and economic progress. As a math major at Catholic University, you will master mathematical concepts, learn problem-solving skills, and explore the various roles of mathematics in modern civilization. Do you want to teach math? You can take math courses alongside secondary-education courses, and graduate in four years certified to teach math in a middle school or high school. Catholic University also offers a combined math and physics program for qualified candidates. How can mathematics describe the natural world? Is mathematics the language of nature? In your first year, you will join a learning community of about 18 students to take classes in philosophy, theology, and English. In these classes, you will be challenged to think beyond the formal language of mathematics and engage in the study of nature itself, while also strengthening your critical thinking and writing skills. 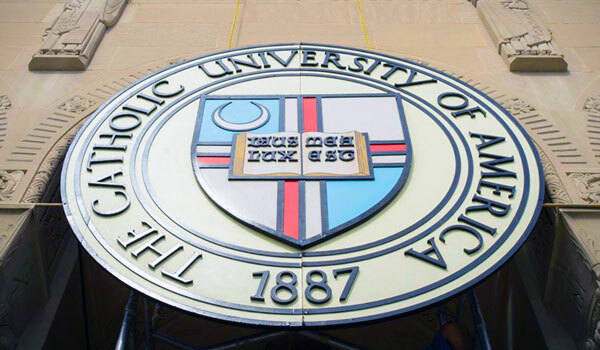 Catholic University's location will give you access to one of the largest hubs of scientific research in the country, with proximity to the nearby Smithsonian museums, NASA's Goddard Space Flight center, and the National Institute of Standards and Technology (NIST). You'll also become a part of D.C.'s large network of academic research institutions, which includes Catholic University's own extensive library facilities. At Catholic University, you will be a part of a close-knit community of learning. In a comparatively small math program like Catholic University's, you will have personal access to your professors, who will guide your course of study. Your professors and classmates will also form a professional network that will last beyond graduation, connecting you to job opportunities. Mathematicians have the opportunity to make a lasting impact on many different fields, including physics, economics, computer science, psychology, and government. Many Catholic University mathematics majors have gone on to careers in industry, government, law, business, and mathematics education.